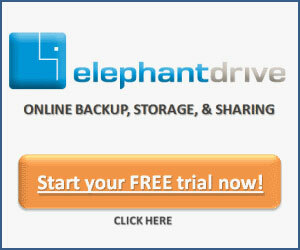 ElphantDrive is your simple cloud backup answer. They backup, store, sync and allow you to share if you want. New users can try their services FREE for 15 days. You’ll get access to their Lite Account which is 2GB free. That is enough to give you an idea of how ElephantDrive works. * Your Files accessible anywhere!